Capitalizing on the successes that she found on Unpretty Rapstar, Jimin from AOA is back in a new hip-hop project. Originally entitled ‘N Project’ from her company FNC Entertainment, she paired with N.Flying’s leader Seunghyub to release a digital single as the project group Jimin N J.Don. Their song “God” is a hip-hop song that sees both participants trade bars over a trap beat. The beat in “God” is a pulsating, glitchy affair. The tempo slows a beat during the verses before building back into a quick rhythm. Rhymer and Assbrass both return as producers after their prior successful production for Jimin with “Puss.” In “God,” the sound and images push forward this image of being the ruler, the true rulers of Westeros, or whatever area – in this case perhaps the music scene. Jimin and J.Don both take their turns sitting upon the (literal and metaphorical) throne; images of crowns combine with a gold and red color scheme, which permeates the clothing, to emphasize a dominance over this space. “You can’t handle me, you’re a coward. Jimin pushes this statement forward – purporting that any opposition that tries to denigrate her ability would not match up when faced against her. On the other side of the spectrum, in perspective, J.Don takes a more humble approach. He recognizes his status as a rookie in the business. His verse is geared towards introducing himself and putting his group’s name on the map. J.Don raps about his struggle to gain recognition. Originally, his group N.Flying was supposed to debut in 2014, but after some injuries and setbacks, they have yet to make their Korean debut. “No one knows who I am. There is a fire underneath his words. He points out obstacles to his success. Seeking to find respect while an idol and also a rookie is something not an easy task. J.Don asserts his intention to make a name for himself. On this track, he puts on a rap introduction that establishes this fiery ambition to make the name J.Don known. 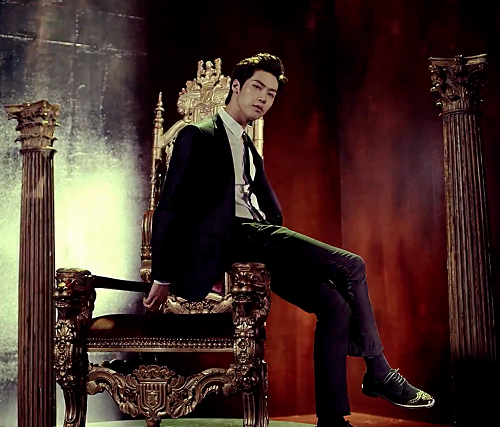 The music video emphasizes the authoritative tone of the song with presentation of objects holding a symbol of power. Each chair that they sit on is regal. There are ornate crowns on display. These are interestingly contrasted with emblems of victory over their opposition. In one scene, skulls, a checkered face and antlers are propped on pedestals – a kind of gallery of those adversaries who they have overcome. There is another side to the checkered theme that shines through. Jimin and J.Don sort of represent different sides of a coin. While Jimin publicizes her power, citing her amassed popularity, J.Don seeks to reach that same height through his ambitious struggle. The checkered motif brings out this duality in the patterns in clothing, through the chess props of the knights, and in the graffiti words scrawled on the walls. Overall, “God” is an intriguing project. As someone who did watch Jimin’s progress through Unpretty Rapstar, I found her lyrics to be not as memorable aside from a few lines here and there — I still don’t get a sense of the real ‘Jimin’ nor that there was more depth in her story. While some of the lyrical content and the delivery of the rapping isn’t particularly outstanding, the song does present a strong conceptual theme overall. The MV reiterates these themes throughout and brings out the duality and power in the props and color scheme. As an introduction to J.Don, it serves its purpose in introducing him to a wider audience. Overall, this song sounds like it would be popular in clubs just based on the beat alone, and conceptually the MV is quite concise in its regal presentation.